What is a Delaware Promissory Note? Delaware Promissory Note: What Is It? A Delaware promissory note is a legally binding document between a borrower and a lender when it is properly executed under Delaware law. The purpose is to outline a contractual agreement on how a loan will be repaid. Delaware promissory notes may be secured or unsecured. When a promissory note is secured, the borrower promises to give the lender something of value if the borrower does not make payments as agreed. The item is known as collateral. When collateral is used, the promissory note may be treated as a secured transaction under Title 6, Article 9 of Delaware law. Without a promise of collateral, the note is considered unsecured. If the borrower doesn’t pay, the lender cannot take any property belonging to the borrower. Instead, they will need to file a lawsuit if they want to get repaid. The maximum amount of interest that may be charged with a Delaware promissory note is set by state law. This law, known as an usury law, states that the maximum amount of interest that may be charged is 5% over the Federal Reserve discount rate. A lender that charges more than the legal maximum can cause them to face prosecution by the state. The date that the promissory note was created. 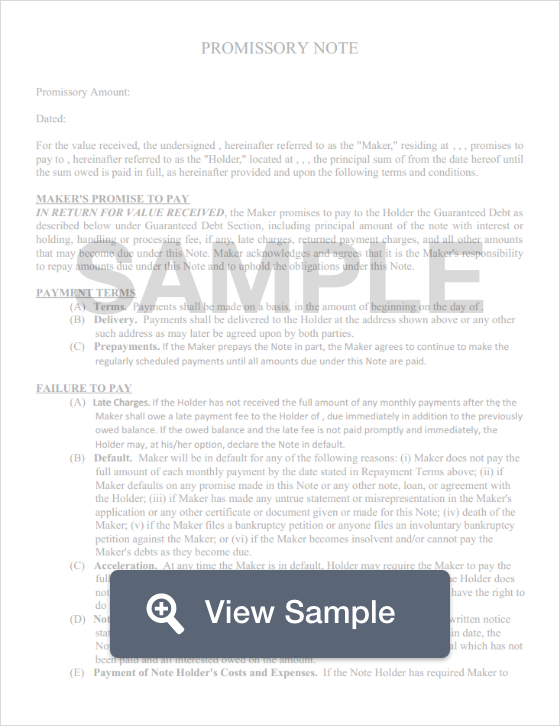 Beneath the title, the promissory note should list the date it was created. This is formatted as month, day, and year. The legal name and the mailing address of the borrower. It is important to also indicate that the person named is the borrower. For example: Anthony Jones, Borrower. If the promissory note is secured, include the physical address. This could be helpful if the lender needs to collect the collateral because of non-payment. The full legal name and mailing address of the lender. The individual or entity should be notated as the lender. For example: Susan Smith, Lender; Smith Personal Financing LLC, Lender. The mailing address will help the borrower know how to contact the lender via mail if necessary. The principal loan amount. This documents the original amount of money that the lender agreed to loan to the borrower. This number is separated out from the interest. Interest is addressed on its own. It is important to ensure that the number listed here is accurate. Always double check the amount before the document is printed and signed. The amount of interest being charged on the loan. This is listed either using the term “per annum” or “annual percentage rate (APR)”. The most that may be charged with a Delaware promissory note is 5% over the Federal Reserve discount rate. Payment information. Most Delaware promissory notes are paid monthly or biweekly. This section should explain how payments should be made (weekly, biweekly, or monthly), the amount of the payment, and where the payment should be made. It should also list how many payments the borrower will pay over the life of the loan. Additionally, if the lender charges a late fee, the amount of the late fee and how many days after the payment was missed that the fee will be assessed. An important component that must be inserted into secured Delaware promissory notes is identifying information about the collateral that secures the loan. If this isn’t included, the lender may not be able to legally collect the collateral. If the lender sues the borrower for defaulting to try to collect the collateral, the court may decide that the promissory note is actually unsecured because it wasn’t properly drafted. Interest Due in the Event of Default. This clause explains how interest will be charged if the borrower defaults on the loan. Payment Allocation. This clause explains how the payments received will be split between the principal balance and the interest. For example, 45% of the payment is applied to the balance and 55% is applied to the interest. Prepayment. When a borrower prepays a loan, it means that the borrower pays it off before the promissory note’s expected date of completion. Sometimes, Delaware promissory notes punish a borrower for paying off the loan early. While it’s not a requirement, the purpose behind doing so is to help the lender make up for what they may lose in financing charges. Acceleration. An acceleration clause gives the lender the right to insist that the borrower pay the full balance of the loan if they do not adhere to the terms of the agreement in some way. Attorney Fees and Costs. If a dispute arises from the Delaware promissory note, this clause is used to explain how the attorney fees and costs will be split between the borrower and the lender. The two most common arrangements include the two parties paying their own expenses and the borrower paying for the lender’s expenses if the borrower is found to be in default by the court. Waiver of Presentments. This clause states that the lender does not have to be physically present to accept payments from the borrower. Severability. This clause states that if any part of the Delaware promissory note cannot be enforced, the rest of the agreement is not thrown out. Conflicting Terms. A clause for conflicting terms explains that if the promissory note has any terms that conflict with each other, an amendment will resolve the conflict and govern the agreement. Notice. The purpose of this clause is to inform the borrower of whether or not they will receive any sort of notice if the lender decides to sue for defaulting on the loan. A Delaware promissory note should be dated and signed by both the lender and the borrower. While there is no legal requirement to have the promissory note witnessed or notarized, one may find this helpful when dealing with a secured promissory note.